Talk about shooting the messenger: Activision is apparently punishing a French site that reported on Amazon leaking the news that Black Ops 2 was coming. The French version of online retailer Amazon apparently revealed that this year's Call of Duty entry would be called Call of Duty Black Ops 2. Amazon quickly removed the product page, but not before it was reported on by French site Gameblog. Since then, Activision is reportedly punishing the site for reporting news of the incident. Gameblog then claimed that Activision demanded it remove its original report too. When it refused to do so, the publisher apparently rescinded an invitation to a Transformers: Fall of Cybertron preview event and pulled advertising bookings it had with the site. The publisher has thus far declined to comment. OK, let's be honest about this situation: Activision's reaction seems ridiculous. 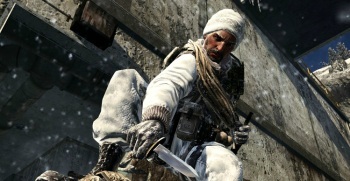 Black Ops (which is pictured) is the best-selling game of all time. Activision's never really shown much imagination when it comes to naming entries in the Call of Duty series. Since the publisher had already announced that there would be a new Call of Duty game hitting shelves this year, a lot of people believed it would be a sequel to Black Ops, anyway. While it makes sense that the company wouldn't be happy with Amazon listing the game before it was officially announced, bullying a site that reported on this seems like a surefire way to earn a lot of ill-will. Activision doesn't blacklist journalists. We believe this was a misunderstanding and are working towards a resolution.